Haiti is situated in the Caribbean Sea (remember “ker-i-BEE-an”) right between Puerto Rico and Cuba (or Puerto Rico and Jamaica). It takes up half of the large island Hispaniola it shares with the Dominican Republic. Because of proximity, they also share many similarities in history and cuisine. Much of the Caribbean and southern part of Florida was inhabited by the Taino people. Those same people developed “barabicu,” a type of cooking that is now ubiquitously known as barbacoa, barbecue, or BBQ. 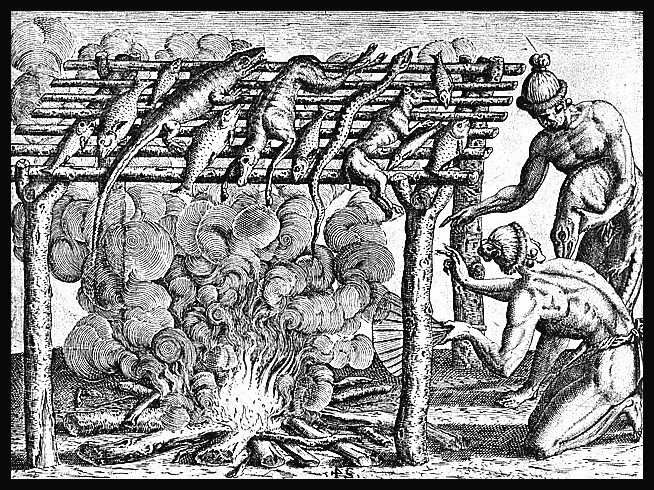 The Taino cooks would create a wood platform of posts with sticks laid crosswise and set an animal or meat on top with a fire burning underneath. It is easy to see how the set-up resembles the contemporary grill with the food set on grates above a burning fire. The burning wood and meat drippings gave off smoke which flavored the meat imparting it with its beloved and classic barbecued flavor. This technique was also used to guard against wild animals at night; Taino people would burn barabicu platforms to ward off attacks. European Influence – Native Influence: It goes both ways! 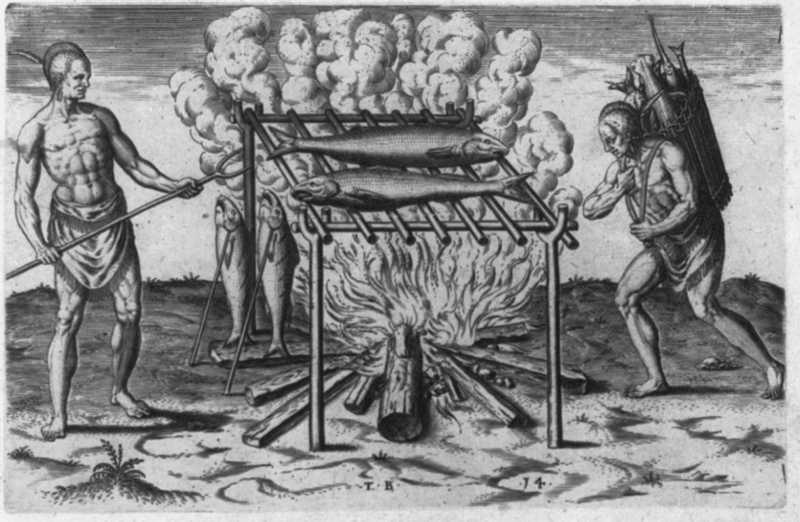 Europeans, particularly Spanish explorers, liked the cooking style and integrated it into their own cuisines. Gonzalo Fernández De Oviedo y Valdés dubbed the style “barbacoa” in his 1526 dictionary Diccionario de la Lengua Española (2nd Edition) of the Real Academia Española. However, they also brought their own influences on the region. Spaniards brought in African slaves, and foods like okra, taro root, and lots of spices which further developed creole cuisine. Later acquisition of the western (Haitian) side of Hispaniola by the French brought cash crops like coffee, cacao, and sugarcane for their slaves to produce. Eventually, the slaves revolted and they won their independence in 1804, just a few years after the USA freed itself from British tyranny. With their newly earned freedom, many former slaves and slave owners migrated to New Orleans. They spread creole cuisine to the US and introduced foods like the staple dish red beans and rice known on the island as diri kole ak pwa. 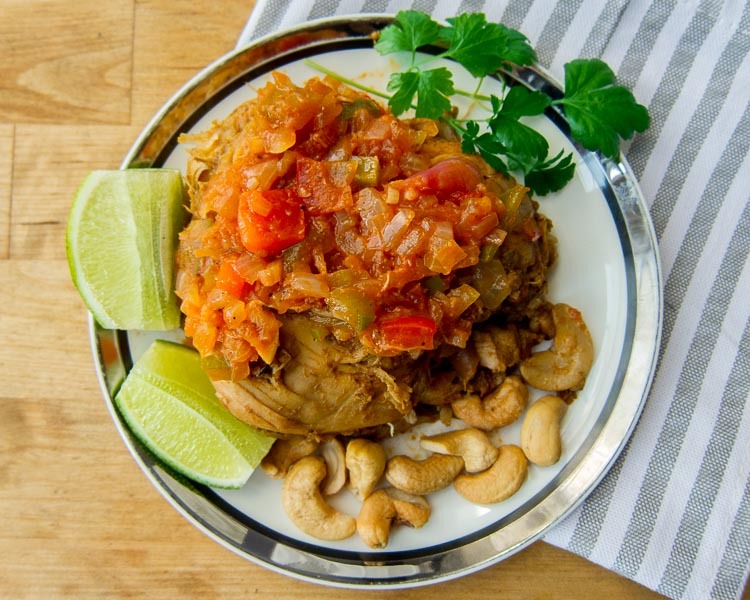 Diri kole ak pwa is still a common preparation on the island and is often served with things like red snapper or a stew known as bullion, which resembles Goat Water another Caribbean dish we made for our St. Kitts and Nevis. If you must have Scotch Bonnets, you can get them off Amazon for about 3 times the price of a ribeye steak. Hopefully, you’ll have cheaper sources available to you locally. Note that jalapeños are not a good substitute – not only do they have a completely different flavor profile, at their hottest range they’re only 1/5th as hot as the habañero or Scotch Bonnet at their low end. Now while I’m a self-disclosing fan of hot chiles, you don’t have to be scared of these high heat indexes. We’re not going to turn your mouth into a fiery inferno. The hot peppers are tempered with traditional mild bell peppers in sos ti-malis. The real heat appears in the pikliz recipe where you will pickle cabbage, peas, and carrots with the hot peppers. Pikliz are used as a very spicy condiment dressing chicken, pork, or whatever else you might be eating. How much you add governs how hot it becomes – it’s up to you! Also, it’s worth noting that Haitian people don’t eat the peppers in piklz, just the rest of the melange. You too can avoid the hottest bits if you wish. Me? I take pleasure eating the habañeros in the pikliz. See The Oatmeal’s post on Sriracha; my face becomes that of the “Tasty Firestorm” when gobbling up food with the pikliz. You’ll love it too! 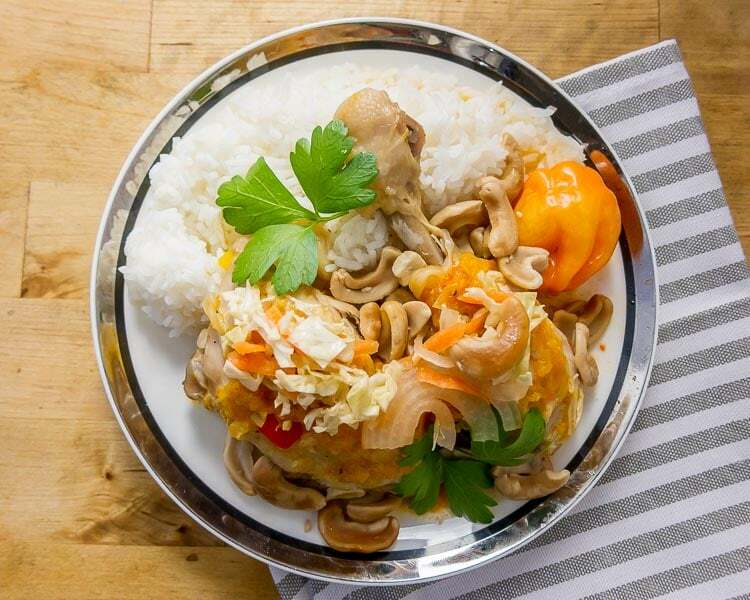 Manman poul ak nwa: Cashew Chicken, the Haitian way! When I began researching dishes for Haitian cuisine, manman poul ak nwa, kept popping up as a signature dish from north Haiti. Creole language being derived in part from French, it is easy to see the resemblance to the French translation poulet aux noix de cajou. In English, it’s literally called hen with cashews, or casually cashew chicken. With that, I began my search for a good recipe. Online search results kept bringing me Chinese stir fries. While delicious, that’s not we were looking for! Maybe another time. I finally found a recipe to start from in A Taste of Haiti by Mirta Yurnet-Thomas. The book was quite easy to hunt down through the public library system thanks to Google Books. I adapted a recipe for Explorers Kitchen from this book by bringing the pressure cooker to what is otherwise a fairly long recipe. I tested it both ways and enjoyed the streamlined version better. The original recipe calls for washing the chicken with lime, a step that is commonly done in the Caribbean. The belief is that it cuts bacteria down, but science simply doesn’t agree and the USDA recommends not washing poultry. It wouldn’t add flavor either since the original recipe had you rinse again after the lime. I also removed the “marinating” step since it would not penetrate far. Futher, it would not have a significant impact on tenderizing or flavor. For your reference, the LA Times did an interesting article on marinating. Finally, the pressure cooked version yields succulent tender meat, while the traditional recipe has some overcooked spots. I cut out almost 2 hours of non-value added time – you’re welcome! Make sure you crack open a cold one for this chicken. A nice Pilsner-styled lager would be a perfect match with these dishes. 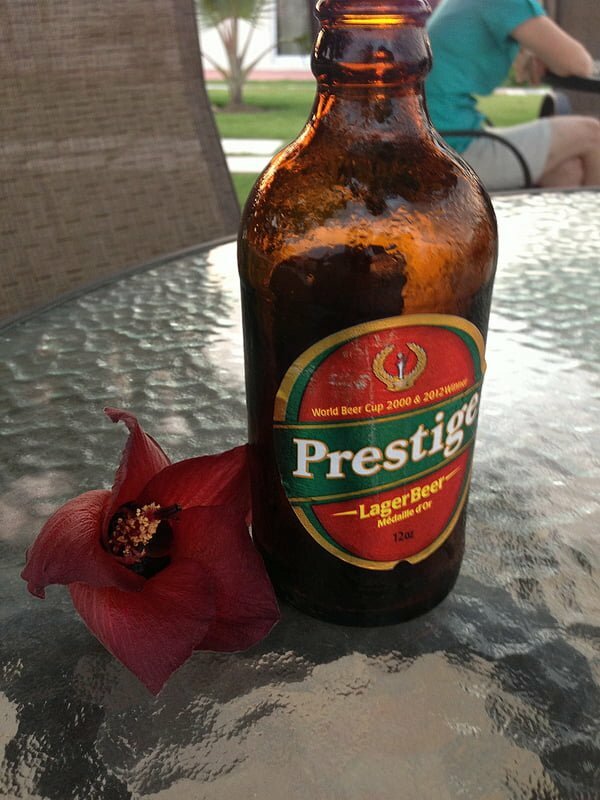 Your best choice is a Haitian Prestige Lager. Combine cashews with 2 cups of water. Combine chicken, pikliz, garlic, onion, green onion, shallot, peppers, parsley, bay leaves, thyme, cloves, salt & pepper, and tomato paste water in pressure cooker. 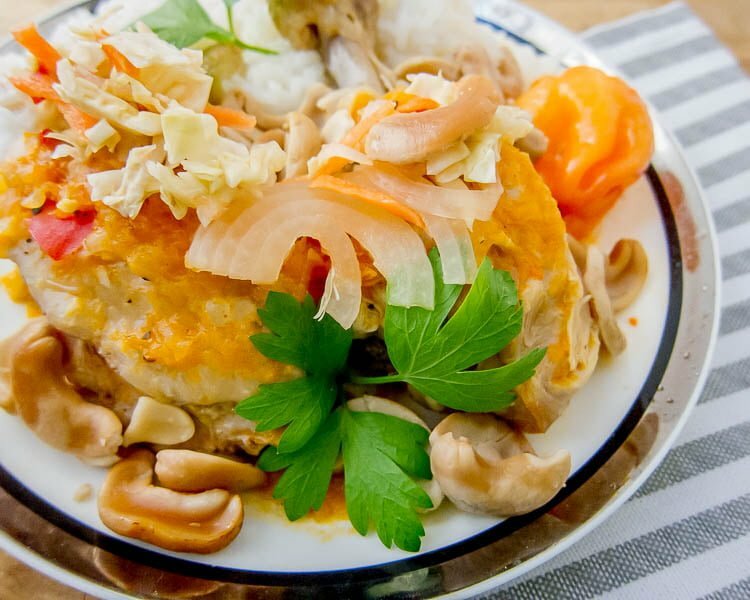 Remove chicken and combine with cashews. Serve with Sos Ti-Malis. Use the liquid and vegetables left over as the base of your Sos Ti-Malis. Simply add the pikliz vinegar and simmer to reduce. 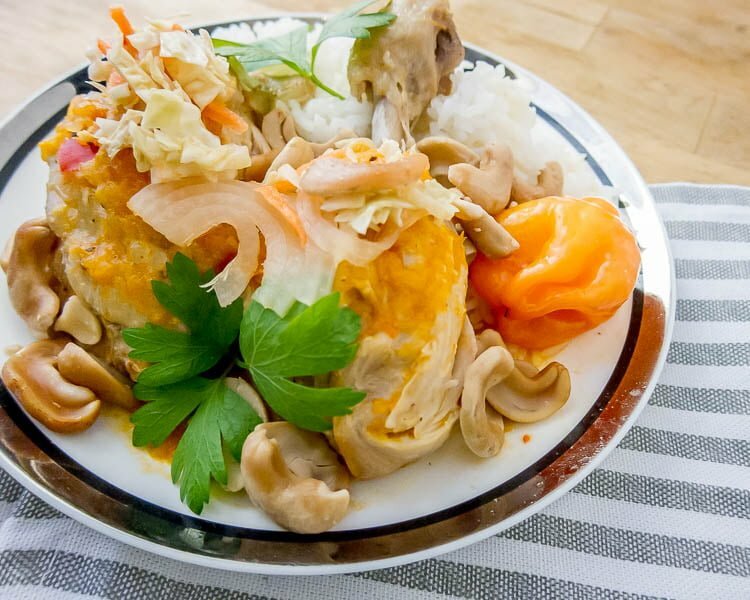 Alternatively, reduce the the liquid and vegetables over high heat with the cashews by ⅔ and toss the chicken in it to finish. Serve with Sos Ti-Malis. 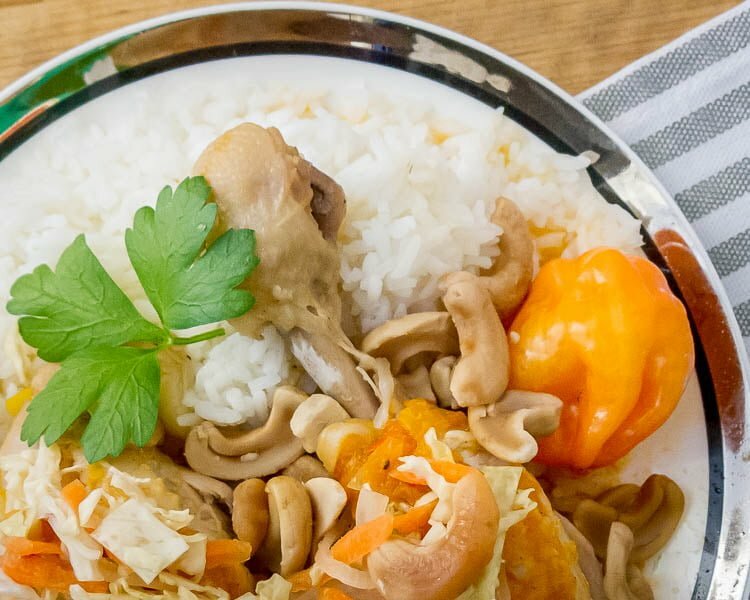 A third option would be to combine chicken, cashews, and remaining liquid in an oven proof pan or Dutch oven and finish in a hot oven at 400F (200C) for 20 minutes. This adds some browning to the chicken, thickens the sauce and deepens the flavor. Serve with Sos Ti-Malis. The first thing we learned is that recipes should be tested before they are published. When we first made the traditional version from A Taste of Haiti by Mirta Yurnet-Thomas, the directions were vague and missing some key ingredients like water for the Sos Ti-Malis. That caused some problems and it didn’t come out quite as good as it was supposed to. When we remade it with our tweaks and streamlining, the results were much better. For one thing, Sos Ti-Malis was actually a sauce! That said, both the traditional and our streamlined methods tasted great. Besides the speed differences and the fact that the amount of active cooking time is way down, one thing we liked better about our changes is that the chicken stays so tender in the pressure cooker. Also, there is no shortage of sauces this way! If you reduce it, the flavor gets concentrated to a rich spicy “gravy” for the meal. We also loved the pikliz! The spicy slaw is a terrific and flexible condiment that would be just as at home on a pulled pork sandwich as it is on the Haitian Cashew Chicken. We couldn’t get enough of it! It brings a fruity heat and a satisfying, fresh crunch that added a lot of interest to the dish. I have a feeling that these pikliz will have a permanent home in our refrigerator as we make new batches. They’re that good! Our streamlined recipe makes this dish achievable on a normal weeknight. I can see us making this one over and over at the Explorers Kitchen. Tried this recipe? Let us know what you think about it in the comments below!